Anne Bradley has worked as a full time primary school teacher for ten years. She studied fine art sculpture at NCAD from 1997-2001 and completed the Postgraduate Diploma in Education at Marino Institute of Education in 2003. In 2012 she completed an MA in Visual Arts Education at NCAD. Her MA thesis, The Classroom as Studio, explores the many relationships between art practice and education. She has designed and facilitated professional development courses for primary teachers in the area of contemporary art. She currently teaches at Rathfarnham Educate Together National School. Guest Editor Katy Fitzpatrick met with Anne to chat about their shared interest in contemporary art practice and children, and how Anne approaches and applies contemporary art and art school pedagogies in her everyday working life. KF: Could you give a bit of background about yourself and how you became a primary school teacher? I’ve always had an interest in education and from Leaving Cert I thought about studying primary education at third level. I am interested in ways of learning and probably have always analysed my own learning; my primary school experience versus my secondary or approaches to learning in sport and music. My mum was a primary school teacher, so that affected me too even if I maybe didn’t realise it. I was always interested in the materials found in the primary classroom used for teaching and learning – from an aesthetic and functional viewpoint. When I finished school I decided to go to art college. I was interested in the idea of studying in an area that allowed me to have a broad range of interests and I felt fine art sculpture allowed me to do literally whatever I wanted. I found I was interested in the methodologies used in NCAD for teaching - especially in first year - the self-directed learning and the criticality that was involved in learning. After finishing in NCAD, I practised for a while as an artist and began to get interested again in education and decided to do the post-grad in primary school teaching. For a while I simultaneously had a studio and was studying for the post-grad but once I got a job as a primary school teacher it became all encompassing and I became a full time teacher. KF: I know that you took a step back from teaching for a year to take time to think about yourself as an artist within the context of the primary school classroom, which led to you taking a Masters in Visual Arts Education in NCAD and the research that you did for your thesis. Maybe you could talk about the MA research and what led you to take the year out? I was teaching for quite a while, about 6 or 7 years, and I began to realise that although I was using some of what I had learned as an artist in art college and I was still engaged with the art scene I realised I wasn’t really using what I knew. I felt that I could do more with my background knowledge and skills - I wasn’t quite getting down to the core of how my art education could influence my practice as a teacher. My year out from teaching was spent travelling with my partner David Beattie who is a visual artist and that year he was involved in a number of residencies and international exhibitions. We spent time in Iceland, Easkey Co.Sligo, Manorhamilton, Toronto, and in Pittsburgh at the Mattress Factory. It was a really valuable thinking time for me and I set up small studio spaces for myself where I could read and research as we travelled. I was also engaged in a lot of great art conversations that year as we met such a huge variety of people. I suppose I began to look at art and artists through the lens of an educator and by meeting many interesting artists and talking to them about their work and observing their research and learning methods I began thinking about the artist as an energetic engaged learner. While in Pittsburgh I was very interested in some of the education programmes in the different institutions in the city. I spent some time observing educators in the Children’s Museum, the Mattress Factory and the Andy Warhol Museum and also spent a day in an elementary school. When we were travelling around Iceland I spent a morning observing in a two-teacher school on the island of Grímsey which is just inside the Arctic Circle. All of these experiences allowed me to question my practice as a teacher and as an artist/educator. I decided that the MA in NCAD (MAVA) looked like a really good way to explore and think about how to connect these two things together. 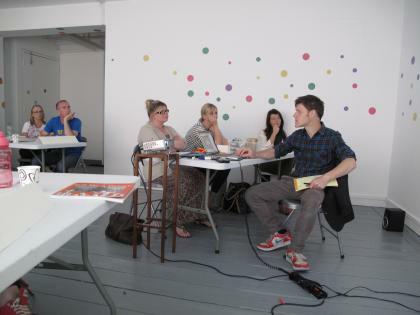 Image shown: John O’Connell gives an artist talk at the Contemporary Art in the Classroom summer camp. KF: Your Master’s thesis talks about art as a way of learning in the primary school classroom and using the art school model / art crit as an approach in this context. What interested you about this? Why did you decide to test that approach? And how did you approach it? One of the key things I was interested in was how artists as learners seem to be very effective life-long learners and I was wondering how I could take these ways of learning and allow them influence my classroom. Because individual artists’ practices are so different from one another and therefore difficult to generalise as approaches to learning, I decided to take an art school approach to the primary school classroom. I would have been doing a lot of testing and playing with art approaches in the classroom anyway in an informal way, but for my thesis research I decided to have one or two specific test projects and really analyse what was going on. One of the ongoing projects that I was testing in my classroom (some of the other teachers in our school would use it quite frequently) is a thing called Choice Homework where children can choose any topic for homework on one night of the week or the month. That had thrown up the idea of children working in a totally self-directed way and bringing their work to their peers the following day and having a small critique around that with feedback from myself and the other children. Some really lovely things had come through that and I decided with my second class that I would try a slightly more focused approach, where I set a project with a very open ended brief. I took a piece of literature, a picture book, called Weslandia and read it as a story to the children. It was about a boy who self-directs his summer holidays and takes his back garden and turns it into a whole other land over a period of a few months. So I read the story to the children and allowed them to respond in whatever way they wanted. It wasn’t necessarily going to be an art response, they could respond through maths by designing a new time telling system, inventing a new language, designing a flag or making a film. They could do anything they wanted and respond in quite an open ended way to the story. It was a homework project to encourage diversity of response but could be done with a friend or sibling. They responded in a huge variety of ways and we used a crit format to analyse their work. We would have done that in a few different places depending on the nature of their work - some of it was presented in the classroom with the interactive whiteboard, some was in the garden and we brought out chairs and they showed 3D works there, and some of the projects were shown in the library where they needed a quiet space, maybe for a presentation or a play as part of their work. KF: And how did they respond to each other, once they understood there was a respect there and they could talk about each other’s work? I think through the Choice Homework they had developed natural critical language and also we have a lot of programmes in the school that allow the children to be critical of each other in a respectful environment. So, I think they were very good at that anyway - but it did really foster that atmosphere of listening and trying to respond positively with critical questions framed correctly. I had been reading about a theoretical approach that the Raqs Media Collective, a group of Indian artist-writer-curators had adopted. It’s an eight step cyclical approach called Riyazz used for the practice of traditional Indian music and they had adapted it as a way of analysing an art practice. So, I took these eight steps as my framework for analysing how the children responded to this project and also, in an informal way, to my own practice as an educator facilitating the project. KF: Were the children aware of these 8 steps? No, that was the theoretical framework that I used to analyse what was going on, so the children weren’t really aware of it. They were aware that I was doing research, but they were more focused on their own work and on each others. So my analysis was separate. I am sure they would have been really interested to hear it, but I didn’t go back to them with that. KF: You mentioned that you did two projects with them, one being choice homework in response to Weslandia. What was the other project that you did? We did a lot of work around looking at current art practice and using that as starting points for other learning. We did a lot of looking and responding, and talking, and a lot of writing. I may have designed lessons that we looked at a visual artist and it turned into a geography lesson or a language lesson that was more about the response and the oral language than it was about focusing on what the art was about. And maybe that is something that I was trying to get at even with the Weslandia project, that the Irish primary school curriculum really allows for a lot of integration and learning across subject areas. I think that is what attracted me most to primary school teaching, as opposed to secondary school, the idea that humans don’t learn in boxes or within the boundaries of a subject area. I felt that art college and art learning allowed me to learn about the world in a very holistic effective way. That was the really important thing for me, to see how I could allow that integrated learning happen, maybe through an art approach. In that way the likes of Howard Gardner’s theory of Multiple Intelligences is relevant - children learn in so many ways and I felt that contemporary art as a way of learning, as a starting point, touches on all of the multiple intelligences. You could be looking at sound art, performance, language – there is so much to work from as an area, it seems to be so rich as a starting point. The other thing was to see if children were free to work like artists in a self-directed way how much they could do – to see what could happen if they were free to explore and play with their own learning if it wasn’t so teacher directed other than to allow space and time for that to happen. After teaching for 6 or 7 years I had become hung up on timetables instead of allowing more free time and space for children to explore things that they are just interested in. Another area I began to think about was to introduce children to making more temporary pieces of work as part of their art learning - in fact children quite regularly make temporary constructions as part of their free play but maybe as the teacher these pieces aren’t recorded or viewed as complete in themselves. By introducing the students to artists who make temporary works this allowed them to value a whole other range of art activities and it enabled us to work in groups and at a much bigger scale. It also allowed a space to value and discuss the incidental beautiful pieces that children often make in an instinctive way during free play. KF: A lot of times in the primary school classroom looking at art is a stimulus for making an immediate response, rather than as a stimulus to have a deeper conversation. Yes, or even just allowing very open ended time, that isn’t about looking at any artworks. For instance we had a project that involved looking at a lot of land art, and I said in a few weeks time we can go outside when the weather is better to respond to this. Over the period of 4 to 5 weeks, the children had brewed up a lot of ideas in their head, so when we did go outside I really didn’t have to say anything – we just went outside and they responded in an instinctive way as I suppose the richness of thought and ideas they had built up came out. We happen to have a nice wildlife garden with a lot of trees and there were a lot of broken branches and fallen leaves and they just started to make and design all sorts of things and they were really busy for an hour or maybe longer. And they didn’t want to come back inside. KF: But they had that time to reflect and think about it. Yes, so in that way that was an art richness. That was the learning to begin with that drew them into all sorts of other things - maybe to talk about different types of trees. We did a lot of learning that wasn’t necessarily about the visual or building or making. It was about habitats and native Irish trees, how different types of wood respond as materials, how some are more bendy and supple, some are structurally stronger. KF: In a very haptic way, they are testing and touching and experiencing. Yes, in that instance it was art that led them to that kind of learning. KF: Thanks Anne, and maybe just one final question. I know that you have done some CPD for teachers during the summer in relation to contemporary art practice. Perhaps you could chat a bit more about this and how the teachers responded? Yes – well the ideas for these courses came from that year out too. I had the opportunity when living in Easkey to design a short art/literacy weekend course for children with dyslexia. From this I began to think about what I might be able to offer to teachers – my experience of art and art learning. So I designed a week long course called Contemporary Art in the Classroom which I facilitated the following summer at Navan Edcuation Centre. The focus of the course was to look at the work of a range of current Irish artists and international artists and explore ways that their work could be integrated into teaching art and other subjects in the primary classroom. There was a great response to the course and it ran for another year but then I decided that it would be better to base the course in an art setting, ideally a studio setting. Supported by Blackrock Education Centre I used Studio 6 in Temple Bar Galleries + Studios as a base location for the course. 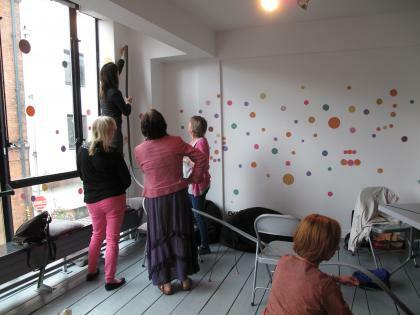 The course was designed around experiencing as many areas of art practice as possible while also taking part in active workshops and conversations around current art practice and the Irish Primary Curriculum. There were a number of projects and theories that I wanted to explore with the teachers which cross boundaries between art and education and I felt were relevant for the classroom – Reggio Emilia approach to pre-school teaching, Room 13 project based in Scotland, Roddy Doyle’s Fighting Words and Mobile Art School. We had studio visits and artist talks with Kevin Cosgrove and John O’Connell at Temple Bar Galleries and Studios. The Project Arts Centre was very supportive and the group had the chance to have a question and answer session with Mexican artist Mario Garcia Torres in the gallery during the install process. They also returned for the opening night and the following day to view the work in the space so they got a sense of what an artist does and the time and thought that goes into exhibition making. They met Tessa Giblin at the Project and got a sense of her role as curator. At Temple Bar Galleries Rayne Booth talked them through the history and development of TBG+S and her role as curator and also walked them through the current show. We also visted the Ark, the darkrooms and exhibition space at the Gallery of Photography and had a printing demonstration at Blackchurch Print Studio. It was a very successful week with a group of highly engaged teachers – some of the conversations and sharing of ideas were really insightful and I learned a lot myself from the experience.